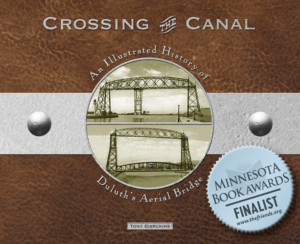 An estimated crowd of over five thousand showed up on Sunday, March 26, 1905, many hoping to ride the ferry bridge. They found disappointment instead: MSS officials did not want to open the bridge on a Sunday because of the potential crowd size; they didn’t want any minor problems in the operation to cause “unfavorable comment” and perhaps even raise fears among “many by whom the new bridge is viewed with distrust.” A good thing, it turned out: that day the power cables feeding the electric motors broke. Wishing to avoid yet another delay, electricians worked to reconnect the cable, and shortly before 6 p.m. on Monday, March 27, with forty people aboard and Gus Rakowsky of MSS at the controls, “the ferry car commenced regular trips.” That very evening it was making runs every five or ten minutes. 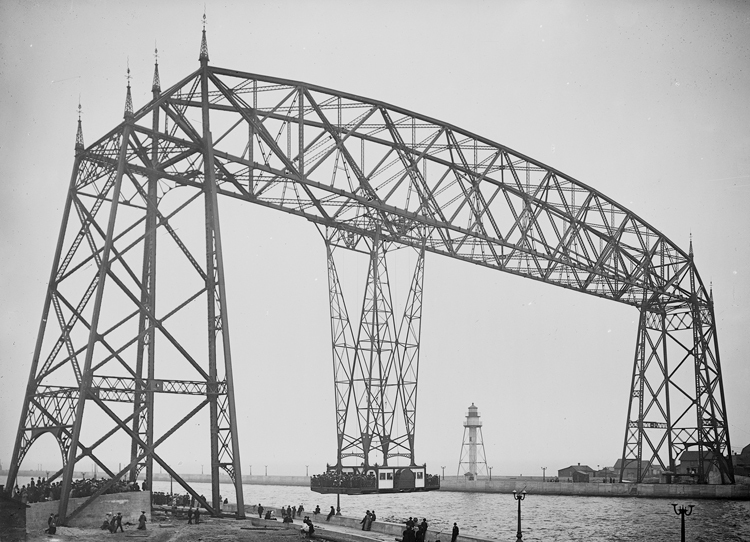 The next day the Duluth News Tribune announced the opening with flair: “Aerial Car Crosses in Teeth of Howling Gale,” it announced, reporting that the bridge operated “without a hitch” despite gale-force winds. The very night the bridge opened the Common Council gathered to figure out who would operate it once MSS had fulfilled its obligation to run the bridge through its first “shakedown” month. One alderman called for bids from “competent electricians” to operate the bridge; another alderman countered that it would be foolish to take control of the bridge from the City. (While the City did advertise for bids, the idea was later rejected, and the bridge has never been operated by an independent contractor. It was a wise decision, as Park Pointers had complained for years about the inconsistent service provided by ferry contractors, and subletting the operation could involve a lot of city time spent on policing the bridge operation.) The aldermen also ordered an arc light placed at the foot of both approaches to the bridge and considered German & Lignell’s plans for waiting rooms. While Common Council records show no reason why, the waiting rooms were never built. Two days later Major Potter from the Corps of Engineers provided the city with a list of regulations for operating the bridge—since it stood on federal property under the Corps’ jurisdiction, it was up to the Corps to say when it could and could not operate. Safety was obviously a major concern, and ship traffic would always have the right of way. While the bridge operated smoothly in the teeth of a gale during its first day, the second day found the car taking rather bumpy rides: a cable slipped, and the source of the problem could not be located that day, so it was left on the south side of the pier for an overhaul. The next day J. K. Lowry of MSS said the drums that the cables ran on were not operating smoothly—but the company had anticipated just such an issue. The problem was that the cogs on the pinion and drums that drove he cables did not properly meet, causing the drum to wobble and, eventually, the cable to release. After some machining to the cogs and tightening of the cable, the bridge was back running by the following Sunday.